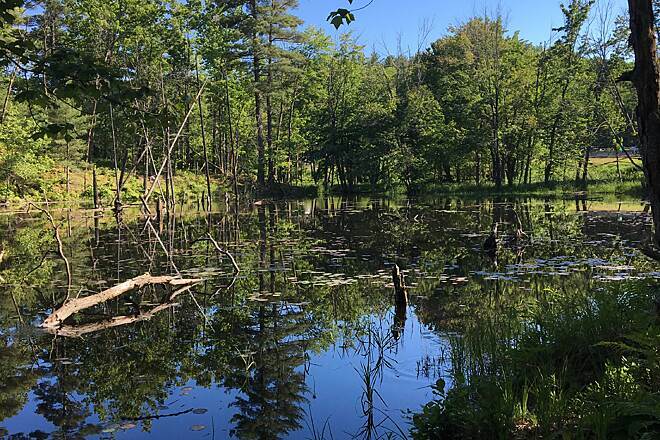 This exquisitely maintained trail slices through forested areas and wetlands for a wonderful experience in southern New Hampshire. 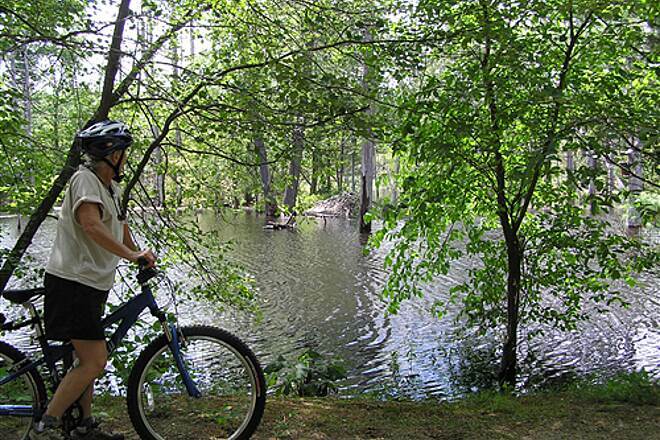 The trail will eventually be part of the Granite State Rail Trail, which is realizing the grand vision of creating a 125-mile trail from the Massachusetts to Vermont border. 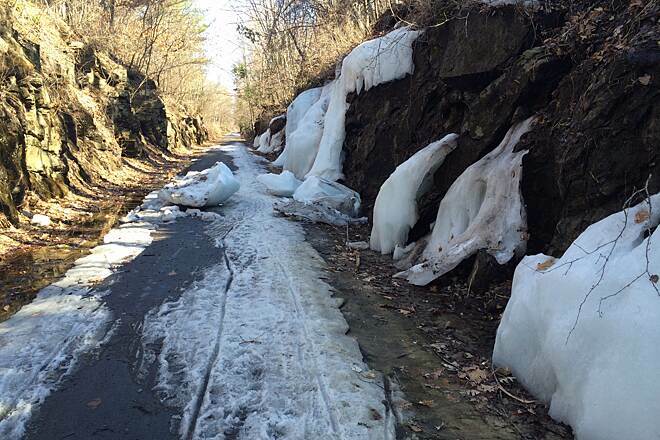 The Derry Rail Trail already makes a seamless connection with the 4.3-mile Windham Rail Trail at its southern endpoint and will eventually connect in the north with the Londonderry Rail Trail, which stretches 3.3 miles to Manchester. 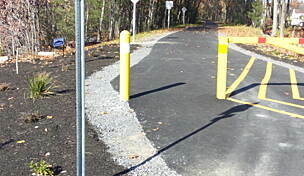 You can also access the 18.3-mile Rockingham Recreational Rail Trail (Fremont Branch), by heading southwest for 0.2 mile on the Windham Rail Trail and turning left onto the new trail just after Depot Road. 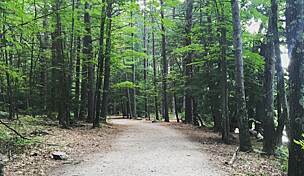 Starting at the southern end, just north of the Windham Depot, the asphalt trail immediately enters a wooded area that invokes a very remote feel for such a populated area. 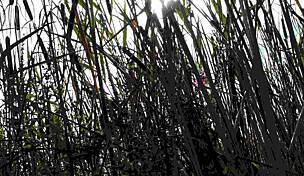 You may see the occasional heron or turtle venturing out of the neighboring wetlands. The trail crosses Beaver Brook over a beautiful stone arch bridge; the middle of the bridge is known locally as Lover’s Leap, and while the origin of this name is not confirmed, it is rumored to have American Indian roots. The trail then enters the quaint downtown area of Derry and crosses East Broadway, where there are bike shops, restaurants, and ice cream shops. The paved section of trail ends in Hood Park, which has a variety of outdoor and recreational amenities, including picnic tables, a playground, basketball courts, and a large pond with a waterfront area. 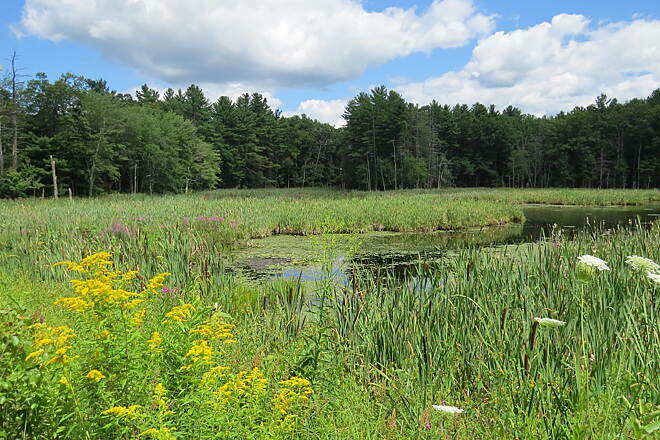 The pond contains multiple species of fish and is stocked annually with brook trout and rainbow trout. If you are feeling adventurous, you can continue on the trail along the west side of Hoods Pond on a dirt path for another 0.3 mile until the path ends. Because this section is not paved, it is only suited for mountain biking and hiking. The plan is to eventually pave this section and create a seamless connection with the Londonderry Rail Trail (see page 114), which currently begins approximately 1 mile to the north. To reach the trailhead at Windham Depot from I-93 N, take Exit 3 onto State Route 111 W toward Windham. Head west 1.6 miles, and turn right onto N. Lowell Road. Go 2.6 miles, and turn right onto Depot Road. Go 0.1 mile, and turn right into the depot parking lot. 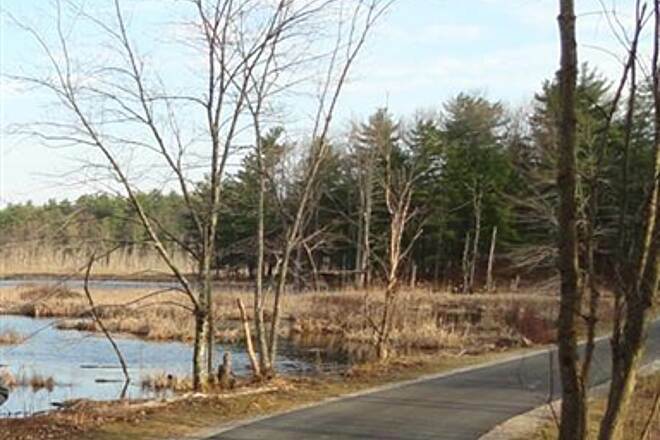 The Derry Rail Trail is located 0.2 mile northwest along the Windham Rail Trail. Parking is prohibited at Windham Depot from 30 minutes after sunset to 30 minutes before sunrise. To reach the trailhead at Windham Depot from I-93 S, take Exit 4 onto SR 102 toward Derry/Londonderry. Turn left (east) onto SR 102/Nashua Road (signs for Derry), and go 0.9 mile. Turn right onto Fordway, go 0.5 mile, and then continue onto Fordway Extension for 0.9 mile. Turn left onto Bowers Road, and go 0.6 mile. Turn right onto Windham Road, and go 1.3 miles. Continue onto N. Lowell Road 0.2 mile, and then turn left onto Depot Road. Turn right into the depot parking lot after 0.2 mile. 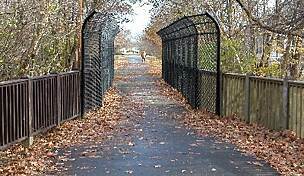 The Derry Rail Trail is located 0.2 mile northwest along the Windham Rail Trail. 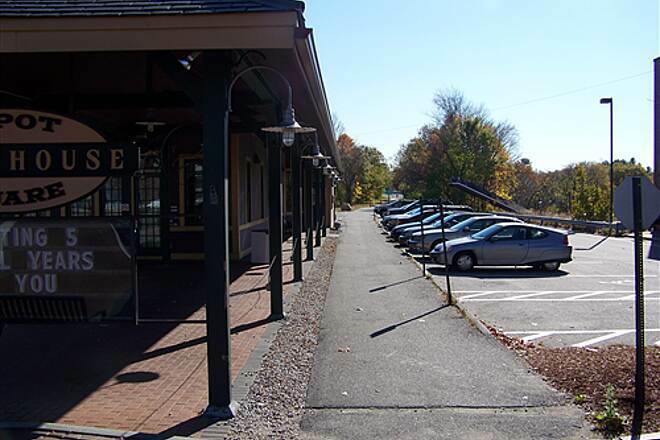 Again, note that parking is prohibited at Windham Depot from 30 minutes after sunset to 30 minutes before sunrise. To reach the Hood Park trailhead from I-93, take Exit 4 for SR 102 toward Derry/-Londonderry. Head northeast onto SR 102/Nashua Road (signs for Derry), and go 0.9 mile. Turn left onto Elm St., go 0.3 mile, and turn right onto Maple St. Immediately turn left onto Rollins St., and the trailhead and parking area will be on the left in about 500 feet. The northern endpoint is located about 0.4 mile north along the trail. Lots of nature to look at while riding. Second half of the trail is almost free of street crossings. Never to busy on the trail so it's a great trail to complete twice a day, even in the weekends. Quick ride and finished Witham trail as well. Makes for nearly a 17 mile bike ride round trip. I chose this trail because it is flat, unfamiliar, and nearby. I also chose it because one of my daughters suggested it. I was not disappointed. I started at the northern end point, Hood Park. Initially I was concerned that it would be nothing more than a neighborhood "sidewalk" bicycle ride. However, after a few blocks the trail opened up and was consistent with the description in the trail guide. I rode as far south as the Windham Road crossing near the Windham Kitchen restaurant and then returned. There are a lot of walkers for most of the length of this trail and most, though not all, seem to expect to share the trail. Only a few pedestrians (and cyclists) showed poor etiquette and failed to make way. Near the northern end point there are a number of road crossings. At EVERY SINGLE ONE, motorists stopped to allow me to cross. I was very surprised. In terms of scenery it is about average for the region. In terms of traffic, the volume was reasonable (light). In terms of convenience, it would be nice if, at the end point, there was information showing where the trail actually starts. Perhaps there is some signage that I missed. All things considered, I enjoyed it and will visit it again in a few weeks. Nice trail .... I am reading the reviews and just realized there is more trail. I started at the windham depot and went towards Derry and Salem. I will have to go back again. I LOVED the little country store and restaurant just next to the depot trail entrance. Beautiful. Start at the depot and go north ~3 miles on the rolling Derry trail or go south on the Windham branch, more down going south, up coming back. You are truly lost in the woods on either branch. It was hot ~85+ in the sun, but considerably cooler under the trees. 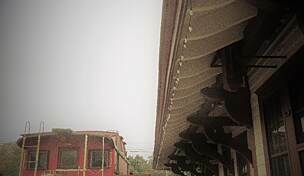 The canopy existed almost the entire length. Mix of hardwoods, pines, ferns, lakes, marsh. We're going back in the fall. I suggest you head for the Windham Depot where there is parking, porta-johns and a great little country store/lunch/dinner place to get something to eat/drink. In Derry there is a well hidden parking area half buried in a residential area; no signs indicating the start of the trail, which just looks like a dirt road at first. Also, no facilities. Both paths are extraordinary. You won't be disappointed. With one possible exception. We biked mid week during a non-holiday, in August. We were warned by regulars to avoid the trails on the week-ends when they are very popular. I rode the Derry and Windham trails on the same day this past week, starting from the parking lot at the Windham Depot and doing a round trip on each from there. The Derry trail has too many road crossings for my tastes. The odd jog (written as "job") mentioned in the review of the Windham trail is actually on the Derry trail. I think it occurs at Bowers Road, but I could be wrong. You come out to the road and have to search for the other end of the crossing a hundred feet or so up the road. The crossing at Kendall Pond road can be busy, and not all drivers feel compelled to think about stopping to let cyclists cross, or at least this cyclist. As mentioned by others, part of the trail parallels I-93, so there's a lot of highway noise for that segment. The good news is there are prominently painted distance markings on the trail, so you can tell how far you've been. Most are oriented toward a start at the Windham Depot lot. It's also well-shaded like the Windham trail. I rode the trail up to the apartment complex off South Avenue in Derry, where it turned into more of an urban ride, so I turned around there. For me, the Derry trail is an OK add-on to the Windham trail if you feel you want to add some distance, but the constant breaks for road crossings were tiresome, especially when compared to the unbroken three mile ride on the Windham trail. I started out in Derry, right by the old train station and road down to Salem, about 8 miles down. The last mile of the trail was hard pack crushed gravel and I would not recommend for a road bike, but I was on a hybrid and had no problems. Otherwise the trail is paved and somewhat scenic. What I like about this trail is that there are very few roads to cross and thereby less stopping and starting. I highly recommend this trail for a nice ride, going at an average steady pace this ride without stopping will take about 1/14-1/5 hours. Nice ride along a historic railway bed. Note Derry has a bike trail network loops from the Hood Park east to Wast Running Brook School and back through Moonshadow Playground, (all of which is marked with signs), to the rail trail intersection at Hall Road/Norton Street crossing. This loop adds another 2 - 3 miles that is with in Derry. 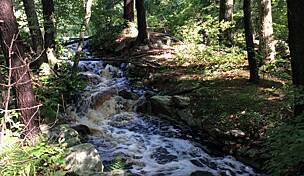 This trail is good on a hot day; it leads to the Windham Trail which will give you full 14 miles round-trip. It's cool and well shaded and scenic. Since this is near my home I can do an early morning ride which I enjoy. Asphalt pleases me-again! My wife and I love to walk, and sometimes bike and cross-country ski, on our local trail. It doesn't have the wildest or most scenic vistas, but it has pretty views of the local woods and wetlands...and now it brings you into downtown Derry. Part of the new trail brings you close to I-93, and that's a bit louder than we'd like, but that's only for a mile or so. Destination trails, to which one travels and visit for specific sites or vistas are wonderful, but having a gem of a local trail which we can use everyday is just as wonderful in its own way. Appreciate and use it for what it is and you'll be happy. and our website www.derryrailtrail.og for all the details!!! Construction began teh week of Sept 19th on the final 2 miles of trail connecting the existing sections of Derry Rail Trail to the Windham Rail Trail. By Spring there will be 8 miles of paved Rail Trail to enjoy - from Hood Park in Downtown Derry all the way to Roulston Road in Windham! 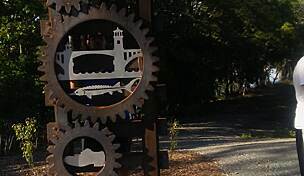 Additionally, the Derry Rail Trail connects to the 4 mile "Derry Bike Loop Path" at Hood Park. This trail connects many of the major schools and parks around Derry. Also, an additional mile or so of unpaved Rail Trail - including the "Rail Tail Overpass" is available to the South of Roulston Road in Windham and down to the Salem NH Town line. This section is due to be paved in the coming year or so. Plans are also underway to continue trail construction from Derry's Hood Park North to Londonderry and on to Manchester where the trial will connect with the many hub and spoke trials being developed by Manchester Moves. Check out this link to view an interactive Google Map with descriptions of the Derry& Windham Rail Trails. 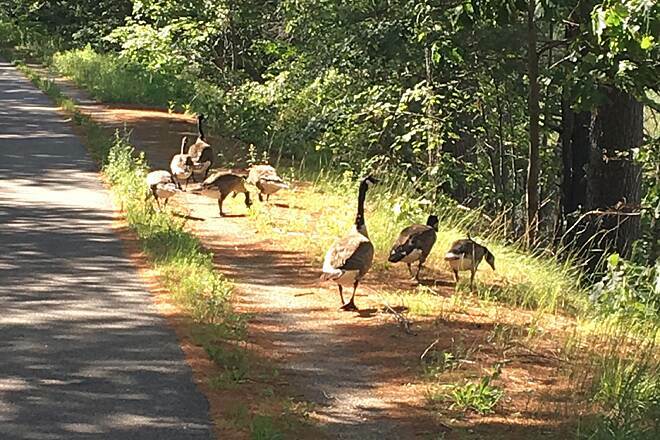 The Derry Rail Trail Alliance is pleased to announce that more of the Derry Rail Trail (part of the proposed Salem-Concord Bikeway) has been paved this summer! 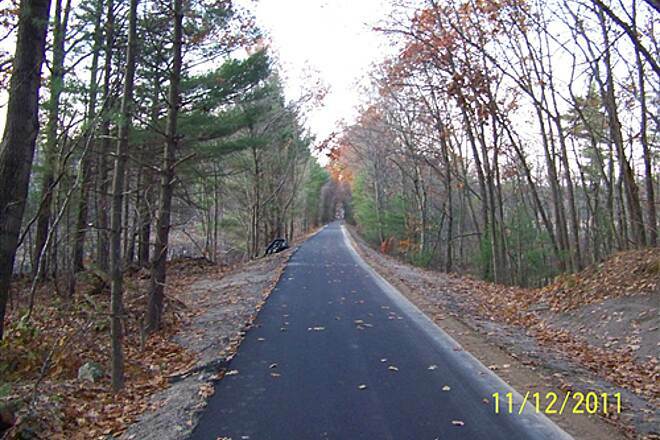 An additional 6/10ths of a mile of trail has been paved between Kendall Pond Road and Bowers Road in Derry as we work to link the existing Derry Rail Trail and Derry Bike Path to the completed Windham Rail Trail. 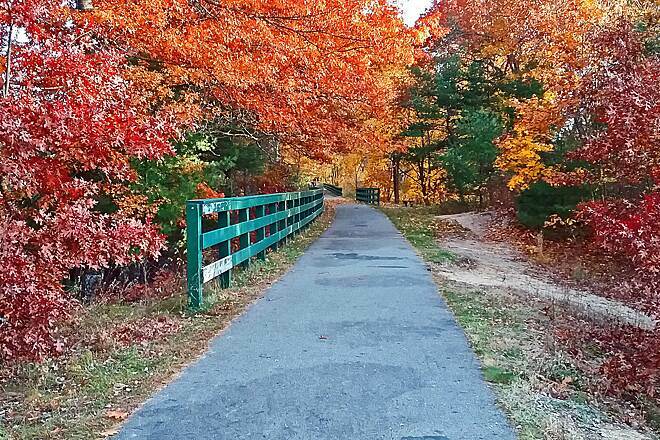 This leaves approximately 1.5 miles of unpaved (but rideable) trail between Bowers Road and Windham's Rail Trail. The Derry Rail Trail Alliance hopes to have this section paved in 2010. Please visit our website www.derryrailtrail.org for more info - and consider making an online donation to help us complete the trail! 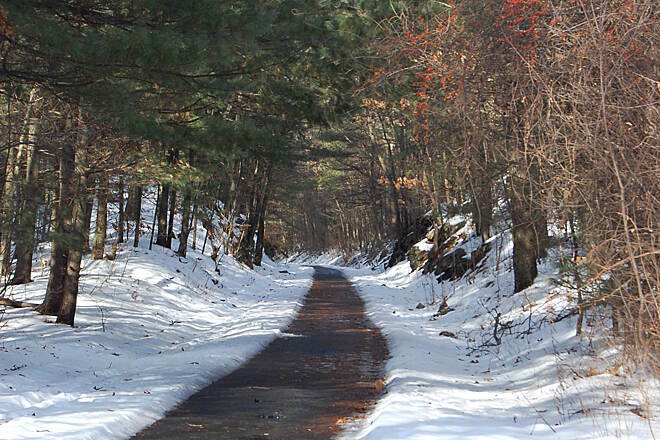 The Derry Rail Trail Alliance is now only $35k shy of our $425,000 Goal to begin construction on the 2.1 mile section of trail between the Windham Rail Trail and the Derry Bike Path. Construction bids are going out in April 2009 and construction should begin in June 2009. 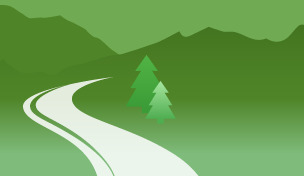 Check out our website at www.derryrailtrail.org for updates - and to donate towards the project! See you on the Windham and Derry Rail Trails! 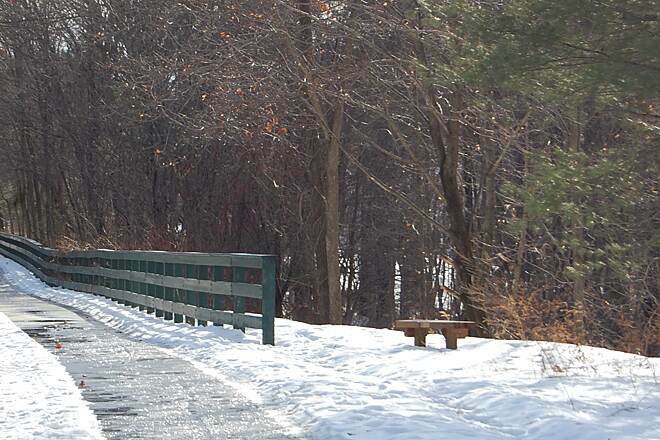 Great news - The Derry Rail Trail Alliance, a nonprofit group focused on improving the Rail Trail in Derry NH was recently formed and is actively pursuing improvement of the unpaved section of rail trail from the Windham Rail Trail to the south up to Downtown Derry. 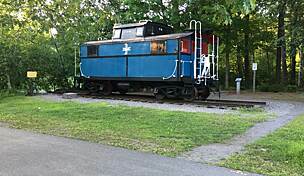 It should be noted that the Derry Rail trail while only 3 miles long actually connects to the 4+ mile Windham Rail Trail to the South and also to the Derry Bike Loop Path - a 4.7 mile bike trail that circles the town of Derry. This provides a continuos trail of over 10 miles for multi-use recreation. The non-rail trail portion of the Derry Bike Path uses a variety of paths, sidewalks and sidestreets - along with a section of the rail trail to circle the town. 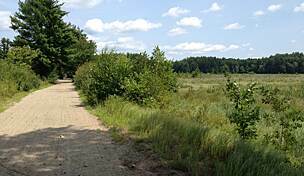 Future plans for the Derry Rail Trail Alliance include improving the rail trail from its current endpoint in Hood Park north to the town border with Londonderry NH. 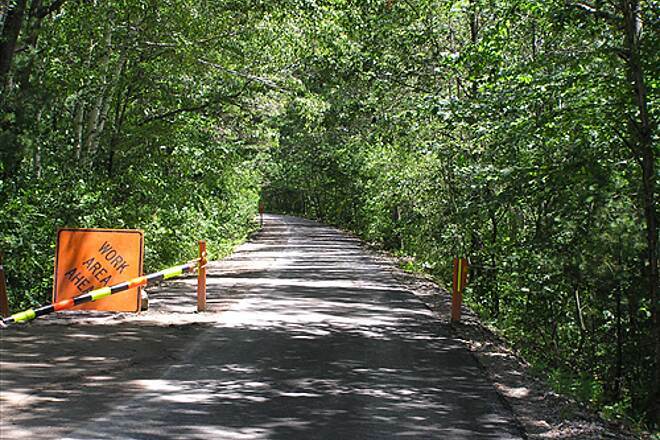 Our ultimate goal is to see the completion of the Salem to Concord Bikeway completed!!! Please visit our website - www.derryrailtrail.org fro more info on the trail in Derry - including maps and other important details.